This is a Document Based Question / Essay that we have our students do after we cover political parties and elections. The structure of it is designed to have students analyze charts, graphs, political cartoons and written documents to come to formulate an answer in an essay form if compulsory voting should be required in the United States. In general, the founding fathers did not believe the president and vice president should be chosen by a direct popular vote of the people. They did not trust that voters would have enough information to make a good choice. Instead, the deleages settled on a system involving an Electoral College. In this system the president and vice president would be chosen by the people but through their states. By using this method the people had a chance to vote, but the states were able to exercise the final vote for president and vice president. 1. Why did the founding fathers not trust the public to vote? 2. How does the Electoral College work as a voting method? A major flaw in the American election process is due to lack of participation. This lack of participation is called Voter Apathy. 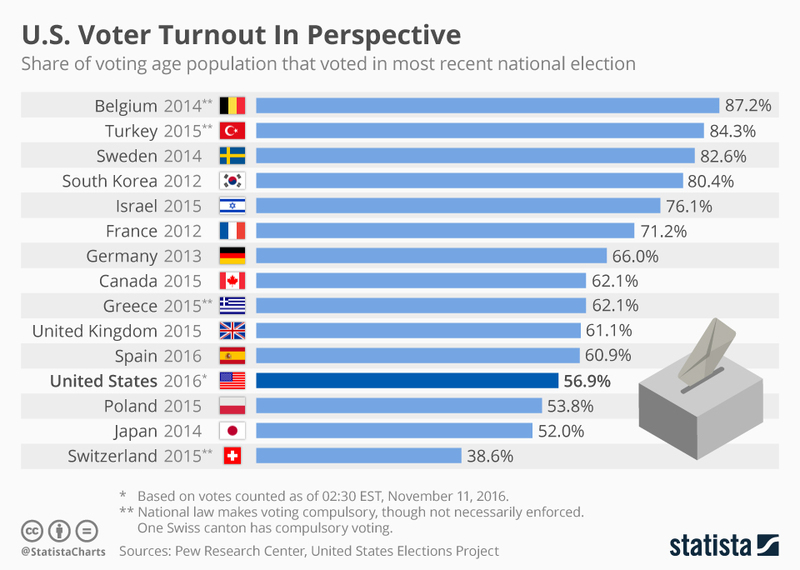 About 55.7% of the U.S. voting-age population cast ballots in the 2016 presidential election, according to newly released Census Bureau figures – a slight uptick compared with 2012, but less than the record year of 2008 and well below turnout levels typical in most other developed democracies. 3. What is the problem with voting in elections in the United States? 4. How does this compare to other democracies? "Should Americans Be Required to Vote"? If you are a future AP World History student your thesis MUST be more advanced than these simplistic models. 1. In 2004, what was the difference in voter turnout percentage between people who had some college or a bachelor’s degree and people who did not have a high school diploma? 2. What can you conclude about the relationship between how much education a person has and the likelihood that person will vote? 3. 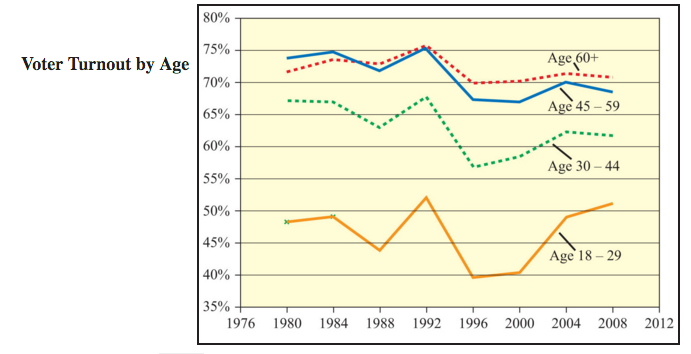 In 2004, what was the difference in voter turnout percentage between people ages 18-29 and people ages 60 and over? 4. What can you conclude about the relationship between a person’s age and the likelihood that person will vote? 5. How can you use this chart to argue for compulsory (people have no option and MUST vote) voting? 6. How can you use this chart to argue against compulsory voting? Document B looks at other democracies that attempt to force the citizens to vote. This includes a list of penalties for failing to vote. 1. 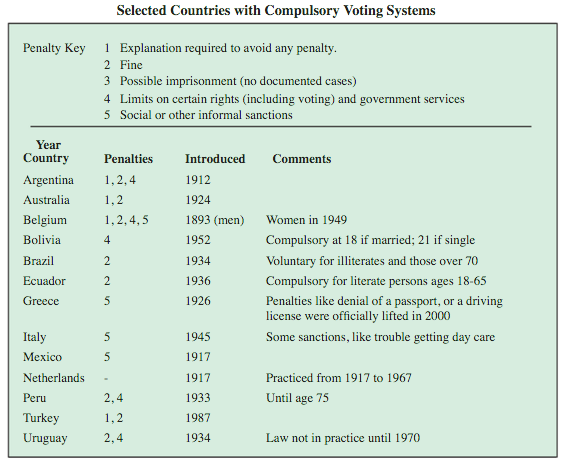 Top document: What are the most common penalties for failing to vote in other democratic nations? 2. Compare Belgium, Turkey and Greece (2nd document). What type of penalties (1,2,3,4,5 from the top chart) seem to do the most to get people to vote? 3. How can this document be used to argue for requiring people to vote? 4. 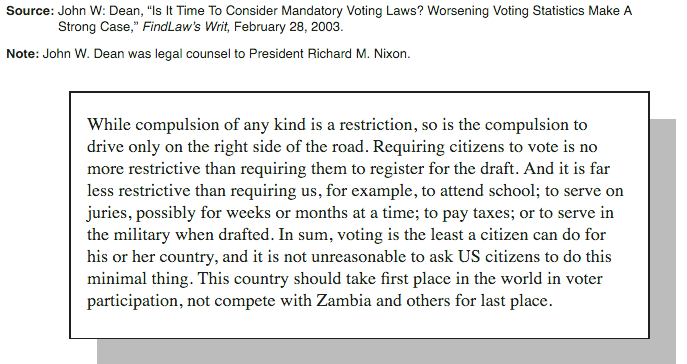 How can this document be used to argue against requiring people to vote? 2. Does the author place greater value on civic duty (what a citizen must do) or liberty? 1. What is supposed to be the benefit if people are force to have to vote? 2. Is this realistic, will people take an active interest if forced to do something? 1. 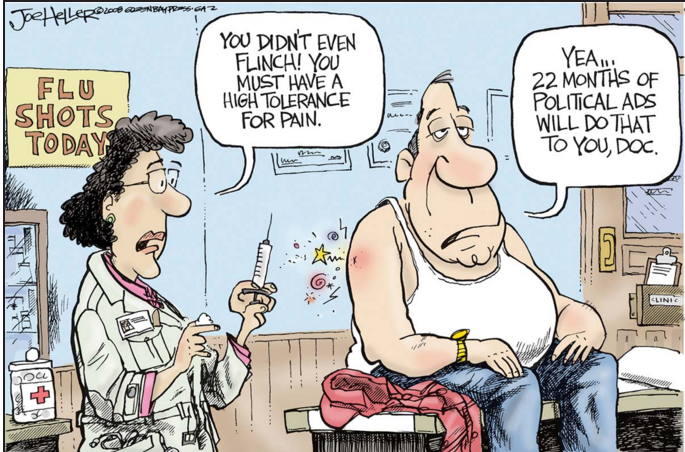 What is the cartoonist saying about the American attitude towards politics and voting? 2. How could you use this document to argue that the cartoonist supports compulsory voting? 3. How could you use this document to argue that the cartoonist opposes compulsory voting? 1. 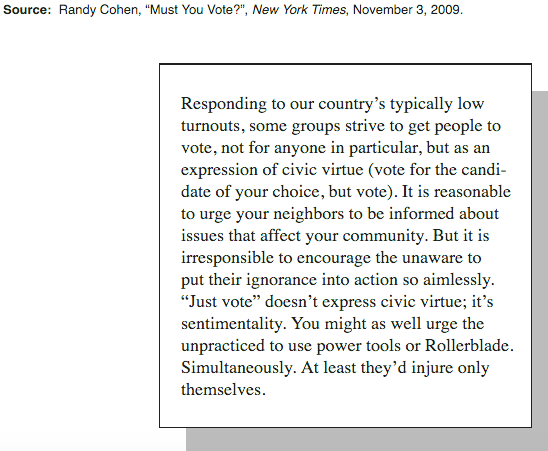 What do you think the author of the quote means when he compares encouraging the ignorant to vote with encouraging the inexperienced to rollerblade and use power tools at the same time? 2. How can this document be used to argue for requiring people to vote? 3. How can this document be used to argue against requiring people to vote? The following information below will help organize your DBQ, BUT the draft and final copy are due on Google Classroom via the assigned Google Document. Body 2 should focus on methods and results of having or not having compulsary voting. Documents don't go in order, so document A,B and C do not necessary go in Body 1.